Between March 23-26 I attended the 2nd International conference on Bajau/Sama’ Diaspora and maritime Southeast Asian cultures in Semporna. It was an interesting conference with skilled scholars who presented papers about long epic songs among Indonesian Bajo (iko-iko), more than 3 000 years old archaeological sites in Semporna and much more. During the conference, I made a presentation about the contemporary challenges facing Sama Dilaut in both Philippines, Indonesia and Malaysia and discussed possible solutions to the crisis. Sama Dilaut are facing a variety of problems, as for example indebtedness, reduced fish stocks, lack of ID:s and market distortion, and there is no easy fix. 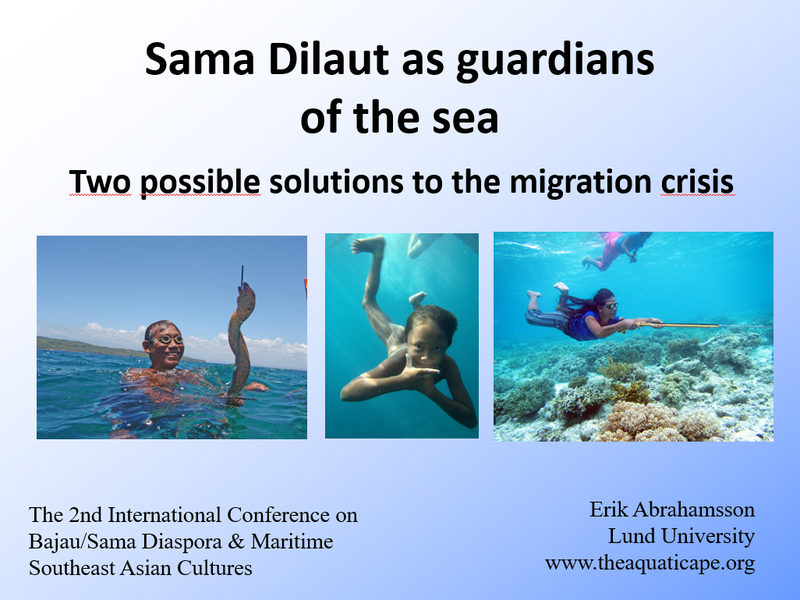 You can see my Power Point-presentation from the conference here: Sama Dilaut as Guardians of the Sea. My conference paper will be published later. Another problem that are facing Sama Dilaut in Sabah are new regulations on use of engines. Many of the smaller engines used to be put inside the boat are now illegal and as a consequence many more Sama people are now using sails than before. The new regulaitons have been in place for little more than a year and has made search for livelihood increasingly difficult for many Sama Dilaut. In the conference, archaeologist Dr. Stephen Chia presented findings of old pottery stoves on the archaeological site Bukit Tengkorak that is more than 3 000 years old and has more or less the same appearance as present day pottery stoves made by Sama people. This might mean that Sama people have been living in the area for millennia, or perhaps they did learn the handicraft technique of people who were already living there. The conference in Semporna was truly international, with Sama people from both from Malaysia, Philippines and Indonesia attending the conference. It was great to see this mixture of culture and language and that the bonds between the Sama groups in the different countries gets stronger. I also came to realize that Central Sinama (widely spoken in Philippines and Malaysia) and Indonesian Bajo are more closely related than I previously thought. I also got to know that there is a quite big Sama Simunul community in London, which I might pay a visit. However, very few Sama Dilaut did attend the conference. Some Sama people with their roots in Sitangkai attended, but no Sama Dilaut from Zamboanga or Tawi-Tawi. And no one who actually lives on the houseboats today in Semporna was there – and they knew nothing about it. The conference also attracted other Sama speaking western people from the Philippines, as for example Luke Schroeder, who runs the website sinama.org. It was the first time that so many “Melikan” (westerner) Sinama speakers gathered in Semporna to the local’s great delight. The conference took place in the Tun Sukaran Muesum avenue, where a lot of traditional Sama fishing equipment and musical instruments can be found, as for example different kinds of pana (spear guns) and kuling tangan (a kind of xylophone still played by the Sama). In the evenings, we joined the Igal festival where dance groups from Tawi-Tawi, Semporna, Kota Kinabalu and Manila participated. There was also a competition with two different competition classes, traditional igal and modern igal. A group from Bangaw Bangaw won in the tr aditional genre. After the conference, I stayed in Semporna for almost a week, and I realised that I have become a well-known figure in the area after the release of a Facebook movie from January this year in which I speal Central Sinama – the video now has more than 400 000 views. During these days, I visited the communities of Labuan Haji, Bangaw Bangaw and Labuan Haji where many Sama Dilaut people without legal papers reside. I also visited some of the outer islands in the region where I met with Sama peoplewho are residing in their houseboats. I was joined by the American film makers Marlena Skrobe and Alice Bungan who are making a documentary about Sama Dilaut. Also during this trip, I visited Mabul where I talked to Sulbin, the famous diver who walks on the sea floor in BBC:s movie “Sea bed hunting on one breath”. I asked him about his eardrums and he said that he had broken them for a long time ago “abostak na talingaku”, he said. He also said that it was very painful but that it is easy to harvest the sea floor after it’s done. In Mabul, I also identified the girl who saves her boat and help tourist children in another well-known video on Youtube. The girl’s name is Sial and she still lives in a houseboat outside of Mabul. Here comes my Photo Phook about Sama Dilaut as PDF: Sama Dilaut – People of the Sea. Over the years, I have distributed approximately 50 copies of the book, which is not for sale but given to people and organizations I meet. At the moment, I am working on a new updated book that will touch more on Sama Dilaut’s culture and challenges as well as different fishing techniques. It will also contain my most recent photos. After the trip to Indonesia I made a short stop in Hong Kong on the way back to Sweden, where I met web designer Albert Chak whom I met in the Human Evolut ion conference in London in 2013. He has a great interest in the Aquatic Ape Theory and has made two very informative posters on the matter, after carefully have studied the work of scientists in the field. In two intense days, we discussed different aspects of the theory, as for example it’s health implications and the emergence of speech. We also discussed how we can promote the theory among a larger audience. My plan is to meet with many proponents of the theory around the world in the coming years as well as baby swimming centres and water birth institutions. On March 23-27 the 2nd International conference on Bajau/Sama Diaspora and Maritime Southeast Asian Cultures will be held in Semporna, Malaysia. The conference will be about Sama Dilaut culture, sacred places, maritime lifestyle and migration. I will present a paper on migration in which I discuss two possible solutions on the Sama migration crisis, derived from extensive field trips in Philippines, Malaysia and Indonesia. I argue that the crisis is part of an international problem facing coastal communities throughout the world, and claim that we should reclaim the concept of Sama Dilaut as guardians of the sea. 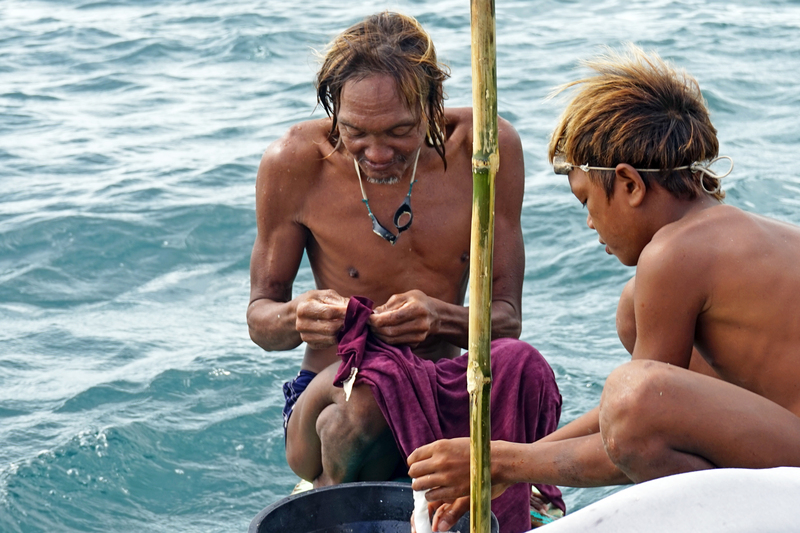 Positive examples can be found in Sampela where Sama fishermen lead a traditional lifestyle within a national park and in Davao were Sama fishermen have been recruited as “Bantay Laut”, with the task of collecting plastic waste and report illegal fishing. From the end of December 2016 to the beginning of February 2017 I travelled in Philippines, Malaysia and Indonesia where I visited several Sama Dilaut communities. 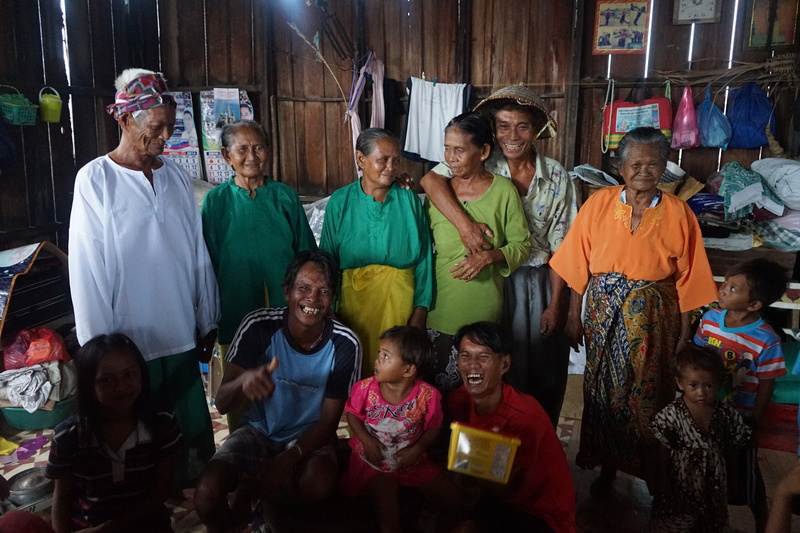 I talked to them about their daily lives, followed fishing and continued to learn the basics of two of their dialects, Central Sinama and Indonesian Bajo. The trip started in Matina Aplaya in the outskirts of the metropolis Davao City in southern Philippines. Fish is on the decline and most people in the village make a living from vending of pearls, second hand clothes and shoes. However, a few families still make a living from the sea, and they are incredible divers. 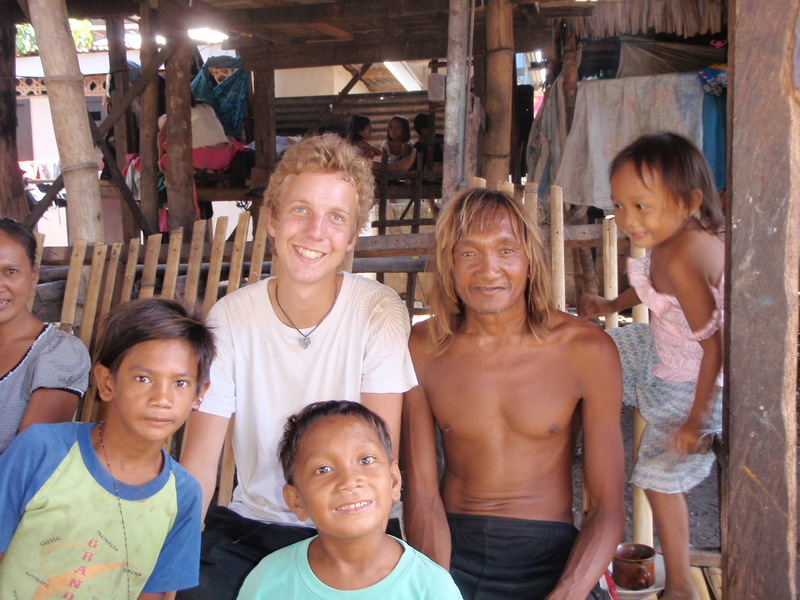 I have been visiting Matina Aplaya every year since 2010 and I have always been accompanied by Issau and his son Noah. Noah is one of the few boys in the village who has grown up becoming a skin diver along with his father. On daily fishing expeditions, they spear fish and collect sea urchins, sea shells and clams in the coral reefs surrounding the town. It is fascinating to see that Noah has grown up to become a skilled fisherman who contributes to the household with his spear gun. In 2013, the outskirts of Zamboanga were struck by a fire that destroyed thousands of houses and displaced thousands of Sama Dilaut and Tausug people. For months, they were living in a temporary camp in a sport arena close to the town centre. After my visit in Davao, I made a two-day stopover in Zamboanga in western Mindanao before travelling to Tawi-Tawi. I visited some newly constructed villages set up by NGO:s and local authorities exclusively for the Sama, and many of the houses have been built in a traditional way. However, the daily life of many Sama Dilaut in Zamboanga is tough and it is getting harder and harder to make a living from the ocean. Many people are begging in the harbour. Yet others have fled to other cities in the Philippines. Despite recent kidnapping incidents in the Sulu I decided to travel to Tawi-Tawi in southwestern Philippines. I visited the Sama Study Center and the Marine museum in Tawi-Tawi where I met Rasul M. Sabal, the museum director. He has a keen interest in Sama Dilaut culture and show sincere concern with their challenges. While in Tawi-Tawi I took the opportunity to pay a visit to Sitangkai along with Rasul M. Sabal and two policemen. Over the last years, very few foreigners have been in the area and I was fortunate to be able to visit the legendary community where thousands of people live in what is called the “Venice of the south” next to a tiny piece of land. In Sitangkai, Sama elders performed religious dance that is normally performed during the magpai baha’u ceremony, an annual ritual taking place once a year in community (this year it will be held in May and it attracts Sama people from all over Sulu and Sabah). It was great to experience their hospitality and kindness! I came to know that the interaction between Sabah and southern Philippines is intense despite stricter migration policies on the Malaysian side, and boats are heading between the locations more or less every night. In Sitangkai, I also saw how octopuses were shipped on a large scale to Tawi-Tawi and further to Zamboanga and Manila. However, the production of sea weeds has dropped due to reduced market prices. After Tawi-Tawi, the initial plan was to take a ferry to Semporna, but the ferry company had lost its license so I took another ferry going back to Zamboanga instead. In the harbour of Bongao, more than 20 Sama Dilaut children were diving for coins, displaying great skills. On the trip back to Zamboanga, I met two Sama brothers from Tawi-Tawi who were on their way to Palawan to join a fishing crew going deep in the South China Sea. They told me that they usually made use of explosives and compressors during these trips, and that the expeditions used to last for about one month. I asked them about their eardrums, and they said that they had broken them. Then, I asked them about their hearing ability, and they told me that their hearing was okay but that they had problems localising sounds. The brothers’ story is interesting since it has been unclear whether Sama fishermen break their eardrums or not. I would say that most the Sama Dilaut divers permanently rupture their eardrums, either on purpose or accidentally, and they take medicine in the case of infection. However, some fishermen do also equalize their ears and some may have hands free techniques for doing so. When the ferry arrived in Zamboanga day after, the scene changed. Nearly 100 Sama begged for money in the harbour, including elders, and the atmosphere was more tense than in Bongao. It got obvious that life is very difficult in Zamboanga, and it is not surprising that so many Sama Dilaut are now roaming the cities of Manila, Cebu and other Philippine cities. After the trip to Sulu, I made a short stop in Semporna where I went to Mabul to meet the Sama community there. I was lucky to meet Sulbin – the diver who walks on the sea floor for nearly two minutes in a widespread BBC production. He told m e that he had just come back from seasonal work in Kota Kinabalu. Hence, also the most skilled fishermen might choose to make a living in the job market rather than make their own fishing trips in the region! However, in Semporna many Sama Dilaut still live in houseboats and they roam the many islands in search of fish, sea shells, clams, sea urchins and so on. Many of the more traditional Sama have no option but to continue extracting resources from the ocean. After the short stop in Malaysia, I went on to Makassar in Indonesia where I met up with Professor Erika Schagatay from Mid-Sweden University, for our third trip together. We headed towards the island of Buton in southern Sulawesi where we spent a few days in the village of Topa (the sama village where Erika Schagatay first came in contact with Sama people in 1988). In the village, we followed fishing, talked to the people and made physiological research on Sama divers. For example, we measured the diver’s lung capacity, spleen size and feet size. After the stay in Topa, we took a ferry to Wangi-Wangi in the Wakatobi island group. We spent one day in Wangi-Wangi before we visited the village of Samepla further out in the archipelago, where we spent four days. Sampela is located more than one hundred meters from the island of Kaledupa and have got attention in several film projects throughout the years, in for example BBC:s series “Hunters of th e South Seas” and the movie “The Mirror Never Lies”. During our stay in the village, we joined a group of women spearfishing, and it was fascinating to see their acquaintance with the ocean. We also followed fishing with Tadi, a 70-year-old fisherman who is still an incredible fisherman. He was the most successful fisherman during our trips, outperforming much younger spear gun fishermen. We also got the opportunity to measure Tadi’s spleen, and it turned out that his spleen is much bigger than peoples at the same age and with the same body size, and whom do not make a living from diving. The spleen is a very critical organ for experienced divers, since it consists of a high concentration of blood cells that can be released under pressure. Also in Sampela, life is getting more and more difficult because of decline in fish. In the community, there is also a problem of indebtedness and large interest rates. Hence, many Sama fishermen are forced to increase fishing efforts despite recent decline in marine resources. Or in other words, they live on resources yet to be extracted. Sampela is located within the Wakatobi National Park, but nevertheless, too little is done to prevent over-exploitation of the area. Big fishing boats enter the waters even though only small scale fishing methods are allowed. Hence, more must be done to reinforce the park regulations and to protect the area and the people living there. My last visit in Indonesia took place in the community of Kabalutan in the Gulf of Tomini, central Sulawesi. Also this community is known from a few TV productions. Here, BBC produced a short documentary about Sama Dilaut with Tanya Streeter in 2007, in which young Sama children dive 12 meters repeatedly displaying great skills. This is also the place where Svea Andersson’s depicts a eight month pregnant woman diving for shell fish in the movie “Sulawesi, the last sea nomads”. Along with two Sama families, I followed on a pongka fishing trip – a fishing trip at sea lasting for a few days. We stayed two nights at sea, collecting shell fish and spear-gunned fish. 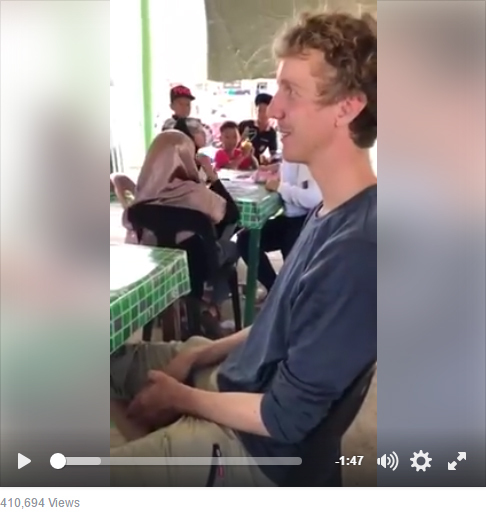 Among those who followed were 17 year old Muspang, the youngest boy in BBC:s movie with Tanya Streeter He is already a father and a great diver. However, I was more impressed by his mother, the same woman that was highlighted in Svea Andersson’s movie. Again pregnant, she was diving up to eight meters in search for shell fish and clams, as well as spear gun fishing. She is one of the last free diving Sama women with great diving abilities; one of the few remaining in not only Kabalutan but most likely in most Sama communities throughout Southeast Asia. However, the amount of large commercial fish in on the decline also in Kabalutan, and it will be difficult for Sama people to sustain a living at the sea. Shell fish and octopus are still in quite big numbers since they mostly are being extracted using traditional fishing methods including diving, but other fish are rare. Who knows what life will look like after just 10 years when the consequences of coral bleaching and rising ocean temperatures will be much more severe than today? Lola Maria is 74 years old but still she paddles to the harbour of Lucena, Queszon, and wait for boat passengers to toss her coins which she’ll dive for – every day. She exhibits great diving skills reaching several meters on her hunt for coins and she can get approximately 100 pesos daily, some of which goes to send her grand children to school. Like most Sama people in Luzon in northern Philippines, Lola Maria orginally came from Zamboanga. She tells us a story that we have heard many times before: a lot of Sama people lead a difficult life on the run, in a world with less fish and more tensions, yet surviving by cooperating closely over generations and taking advantage of their inherited skills. in August 2016, Lola Maria, was featured in a GMA News’ Front Row documentary titled “Mga Barya ni Lola Maria” (The Coins of Grandma Maria). Bajau Laut are famous for their stilt houses that are built meters above the sea level. Islands like Maiga, Denwanan and Pulu Gaya in Semporna attracts thousands of tourists every year for their fascinating houses and people. This architecture can be a great source of inspiration for the green movement, as described in ArchDaily and their article 5 Architectural Secrets of the Badjao: 21st Century Sea People (though it contains some minor errors regarding Bajau Laut’s history and geographical expansion). The key words in Bajau Laut architecture is adaptibility. In west, we generally aspire for solidity, thick and immovable construction, and maximum fortification. We don’t build with the elements, but in order to master them, to control them. The Bajau Laut, on the other hand, have learned how to live with the elements and to adapt their construction to the natural environment. Hence. waves, floods and erosion will be a minor problem for Bajau’s settlements – but at the same time thay will have a closer access to sea life than anyone else. Bajau Laut build short term, and live long term. They continuously replace older materials and they use whatever they can find in their natural surroundings. They have simply accepted the fact that they can’t change the flow of water.